A couple of weeks after my big kill, we've had time to try out a few venison recipes. 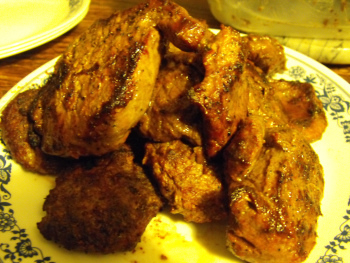 I've learned a lot, and find myself enamored of the taste, which seems closer to high quality beef than anything else. Our first and best experiment was grilling the tenderloin (on either side of the backbone) and upper ham (the top of the "thigh" of the back legs). We let the meat marinate in oil first since venison tends to be very lean, then rubbed it with some salt and pepper before tossing it on the grill. That was so delicious, we all ended up in rapture. Hard to beat. For my second attempt, I wanted to try some of the stew quality meat --- the front legs, the lower parts of the ham, and other random spots around the deer. I tried roasting the venison up with some root vegetables, but I was disappointed --- the taste was good, but I hadn't taken out all of the white stuff (tendons?) that is so ubiquitous in the lower quality cuts of the deer. The white stuff cooks up to be very chewy and hard to eat. I considered this a failure, though Mark gamely munched his way through and proclaimed it a success. My third attempt went much better. Again, I used some of the stew quality meat, but this time I threw it in the food processor first to be chopped to little bits. The white stuff stayed unchopped and was easy to pull out, then I mixed up potsticker filling with the remaining meat. Those were some of the best potstickers we've ever eaten! More rapture. Check out our ebook about how to start a small business.